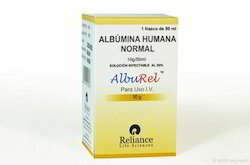 AlbuRel is human normal albumin. Albumin is the most abundant protein in human plasma and is synthesized by the liver. Albumin is an effective plasma volume expander. AlbuRel™ is made virus safe by double pasteurization. Among its multiple physiological roles, it plays an essential part in generation of colloid oncotic pressure. It is used for restoration and maintenance of circulating blood volume where volume deficiency has been demonstrated and use of a colloid is appropriate. Albumin therapy is indicated in hypovolemia or shock, burns therapy, hypoalbuminemia, prevention of central volume depletion after paracentesis, acute respiratory distress syndrome (ARDS), acute nephrosis, renal dialysis, acute liver failure, cardiopulmonary bypass operation, hemolytic disease of the newborn and ovarian hyperstimulation syndrome. AlbuRel™ is available in 20% concentration in 50 ml and 100 ml pack sizes and 5% concentration in 50 ml and 100 ml. AlbuRel™- LS (Low Sodium Albumin) is available as 20% in 50 ml and 100 ml. 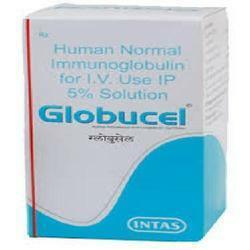 Globucel 5% infusion is used in the treatment of infections. Looking for Human Albumin ?